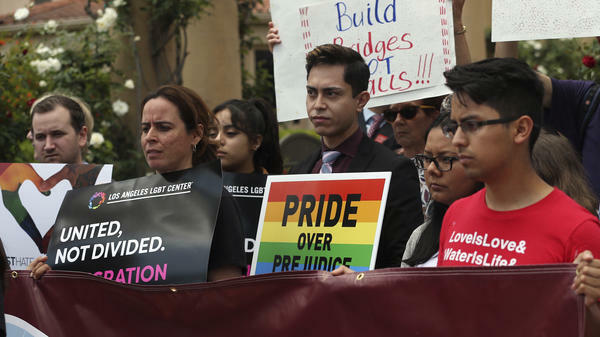 Supporters of the Deferred Action for Childhood Arrivals Act (DACA), gay activists and others demonstrate outside the U.S. District Court 9th Circuit in Pasadena, Calif., in May. The Trump administration has been trying to convince courts that it is justified in ending an Obama-era immigration policy that shielded hundreds of thousands of young immigrants from deportation. Ten states, led by Texas, asked U.S. District Andrew Hanen for a preliminary injunction to force the government to reject renewals for young people currently enrolled in DACA and stop accepting new applications. But Hanen did not issue an immediate ruling and asked for opponents and supporters of DACA to submit legal briefs by Monday. Hanen is perhaps best known as the judge who, in 2015, blocked the Obama administration from expanding DACA to protect immigrant parents. As the Associated Press reports, the proposed expansion never took effect after the U.S. Supreme Court eventually split 4-4, leaving Hanen's ruling in effect. "Most people expect that Judge Hanen is not going to look kindly on the DACA program," says Jessica Vaughn, director of Policy Studies at the Washington, D.C.-based Center for Immigration Studies. 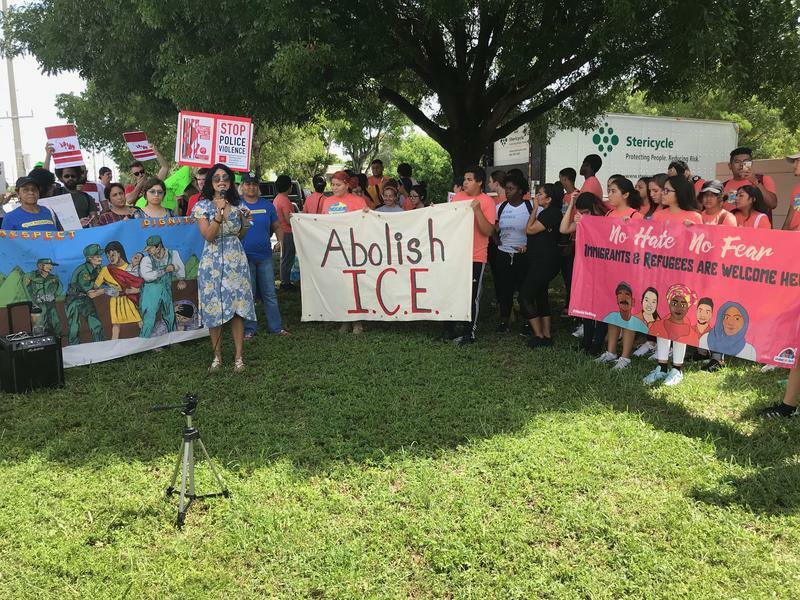 In today's hearing, attorneys for Texas argued that the state is irreparably harmed by a drain on state resources by DACA recipients, Houston Public Media's Elizabeth Trovall told All Things Considered. But legal advocates for DACA argued that the states will have a hard time proving they have been harmed. "Young individuals with DACA grants are living and working and going to school and paying taxes and contributing to local economies. So it is a net benefit to the states to have DACA recipients there," says Nina Perales, vice president of litigation for the Mexican-American Legal Defense and Educational Fund. Texas Attorney General Ken Paxton issued a statement insisting that DACA is unconstitutional and calling his state's lawsuit challenging it "vital to restoring the rule of law to our immigration system." "You know this process is draining, it's exhausting, it's expensive and there has to be a permanent solution and a pathway to citizenship," says Antonio Juaregui of Fresno, Calif. He's a 21-year-old political science major who was brought to this country when he was 5 years old. Juaregui said he first applied for DACA three years ago and he was granted a two-year extension earlier this year. All right. Today in a federal court in Texas, the debate over the Trump administration's immigration policies shifts from separated families to recipients of DACA. Remember, that's the Deferred Action for Childhood Arrivals program which was started during the Obama administration. It was a policy intended to protect young people who were brought to the U.S. illegally as children, protecting them from deportation. The status of those DACA recipients has been up in the air since President Trump came into office. NPR's Richard Gonzales reports. RICHARD GONZALES, BYLINE: Ever since Attorney General Jeff Sessions announced an end to the DACA program last September, the administration has faced several legal challenges seeking to preserve it. But today a court will consider a lawsuit that calls for an end to DACA. A hearing will be held in the Houston courtroom of U.S. District Judge Andrew Hanen. Seven states, led by Texas, are asking for a preliminary injunction to force the government to reject renewals for young people currently enrolled in DACA and stop accepting new applications. Hanen is perhaps best known as a judge who, in 2015, blocked the Obama administration from expanding DACA. JESSICA VAUGHAN: Most people expect that Judge Hanen is not going to look kindly on the DACA program. 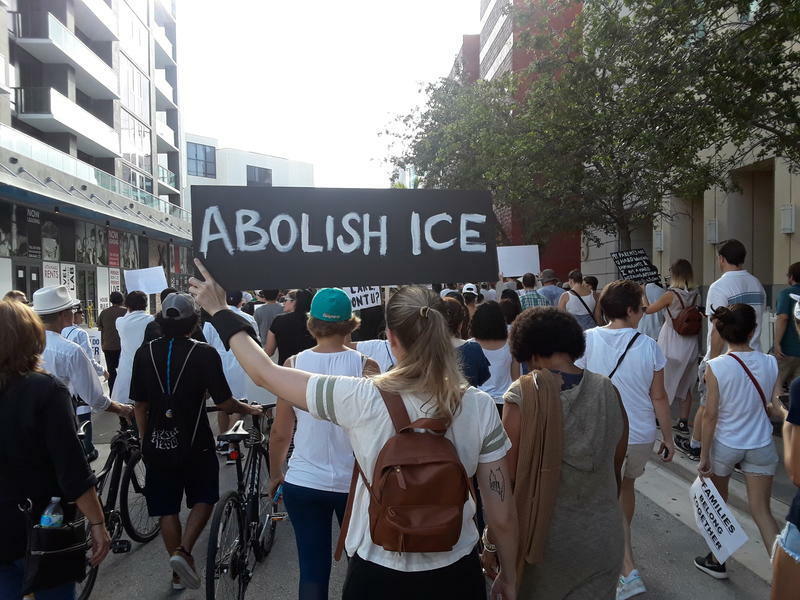 GONZALES: Jessica Vaughan is director of Policy Studies at the D.C.-based Center for Immigration Studies, a group favoring immigration limits. She says smart money bets that Hanen eventually will decide that DACA has had a negative effect on the states in the form of costs in providing services to DACA recipients. But legal advocates for DACA say states will have a hard time proving they've been harmed. Nina Perales is the vice president of litigation for the Mexican American Legal Defense and Educational Fund, or MALDEF. NINA PERALES: Young individuals with DACA grants are living, and working, and going to school, and paying taxes and contributing to local economies. So it is a net benefit to the states to have DACA recipients there. 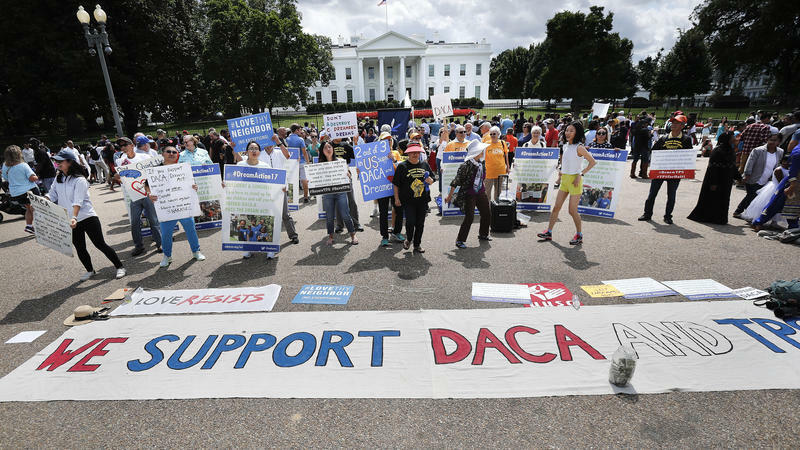 GONZALES: The Texas hearing comes on the heels of another federal court ruling in Washington, D.C., last week which endorsed DACA. District Judge John Bates blocked the administration from shutting down DACA and ordered it to accept new applications. The administration says it will appeal. Judge Bates is the third federal judge to oppose the ending of DACA. The competing legal rulings represent an emotional rollercoaster for DACA recipients. Antonio Juaregui of Fresno, Calif., is a 21-year-old political science major who was brought to this country when he was 5 years old. ANTONIO JUAREGUI: You know, this process is draining. It's exhausting. It's expensive. And there has to be a permanent solution, a pathway to citizenship. GONZALES: But before that has a chance of happening, there will be more court battles. And virtually every legal expert thinks the resolution rests one day with the Supreme Court. Richard Gonzales, NPR News. Transcript provided by NPR, Copyright NPR. Boca Raton-based private prison company GEO Group has issued a cease-and-desist letter to the Miami-based activist group Dream Defenders, sparking a sharply worded response from the activist group.